Sun and rot resistant polyester, easily cleaned, chlorinated and reused over and over. Our multi layered, felt bags are ideally suited for heavy duty mechanical filtrations of particles from 1 um to 200 um (micron) in gravity fed plumbing situations. 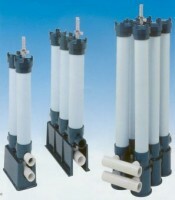 Ideal as primary mechanical filters for return lines from culture tanks in a system. Good for filling reservoirs with raw water containing particulate matter. Use on input lines in recirculating systems to reduce cross contamination. Have hanging strap and 7″ diameter, stainless steel mouth ring which keeps bag open during use. Does not sag and close like poly ringed bags. Come in 18″ length. 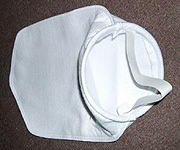 Mesh bags are polyester or nylon filter cloth, one layer thick. Ideal for harvesting, collecting or retaining zooplankton, brine shrimp, rotifers, eggs and larvae of fish and invertebrates. Although they can be used for particle removal, thay are not as effective as the felt bags. A special adapter for attaching the felt and mesh bags is available. It has a 1.5″ FNPT fitting on top for attachment. Felt and mesh bags can easily be cleaned in wash machines.